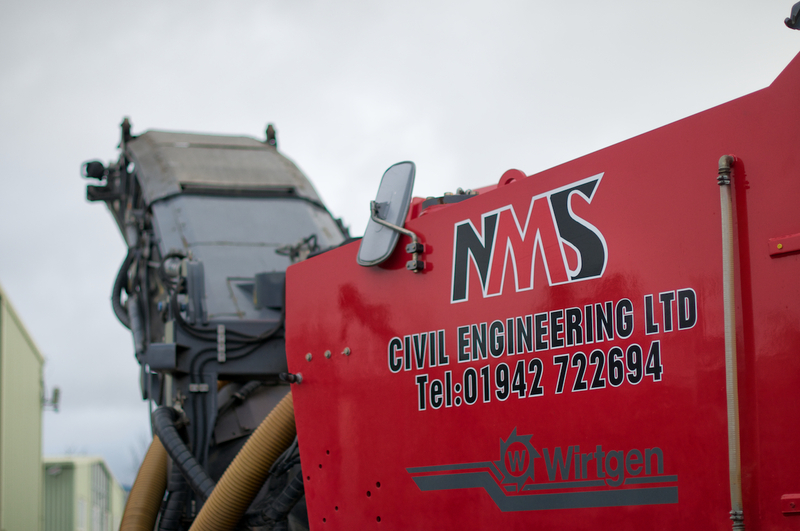 NMS is one of the country’s leading road planing contractors, combining over twenty five years experience in the industry with a large modern fleet , we have the flexibility and resources to service any contract. We are also a member of Safeplane, The Federation of Planing Contractors. We are continually investing in our planing fleet to ensure we remain at the forefront of planing technology; our reputation for safety and service is second to none. Our planing fleet covers the whole spectrum of planing machines, ranging from the W350 (350mm wide cut) suitable for small works and in footpaths and around ironwork, through to the W220 (2200mm wide cut) that can cut to a depth of 350mm in a single pass. Wirtgen W220 – 2.2 metre wide planers. Wirtgen 2100DC – 2.1 metre wide planers. Wirtgen W120F – 1.2 metre wide planers. Wirtgen W100F – 1.0 metre wide planers. Wirtgen W50 – 0.5 metre wide planers. Wirtgen W35 – 0.35 metre wide planers. For more details and technical specifications of these planers click here to visit the Wirtgen website. In addition to road planing machines, we also operate support equipment, both internally and externally, including tipper wagons, low loaders, sweepers, fuel bowsers and hydraulic breaking equipment and are able to offer a full support team capable of dealing fully with any planing project, whatever the size. The entire fleet is supported and maintained ‘in-house’. We operate workshop facilities at our base employing experienced, well-trained specialist fitters. In addition, we provide a full emergency call out response in the unlikely event of a machinery breakdown on site. Furthermore, environmental and resource efficiency demands are becoming increasingly prominent within the 21st Century construction industry. NMS are endeavouring to be at the forefront of such changes and as a part of this have attained all necessary T5 Exemptions from the Environment Agency. This means that all NMS planing arisings in England and Wales are registered as exempt under the Environmental Permitting (England and Wales) Regulations 2010. In addition as part of our Third Party Accredited Quality Management Scheme we maintain a specific protocol. This follows the guidelines detailed in WRAP (Waste & Resources Action Programme). This Protocol has been approved by the Environment Agency, Highways Agency & Highways Agency Agents managing the network and it is now universally accepted within the industry. The protocol basically means NMS produce a product from planing and not waste.